When my Jungle Lord sits in attract mode for a while it eventually freezes up, all displays go blank, only general illumination works and it keeps keeps playing the elephant sound over and over again. Power cycling the game and removing the batteries does not help. The only way I've found to get the game to boot correctly is to remove and replace a ROM chip on the CPU board. So far I've removed and cleaned IC14 and IC17 but the game will still lock up after sitting in attract mode for a while. The game works perfect when it's not frozen. What would cause this problem? If reseating the rom chip fixes it, have you tried replacing the socket? If it's original it's pretty much always needed to be replaced. Especially if you've been pulling the rom all the time. After more testing I've come to the conclusion that the locking up is very random. It locked up again over the weekend and this time taking out the chips didn't help. Sometimes letting it sit for a few days works...sometimes not. Any ideas? New set of game roms? New rottendog board? Could it be a voltage issue? I've only pulled those two chips 3 times. The third time didn't help the situation. I pulled all 4 chips this last time and it didn't help. If reseating the rom fixed the issue even once, replace the socket. I'm not ruling out the sockets but I don't have any on hand at the moment so I'm trying other troubleshooting methods. 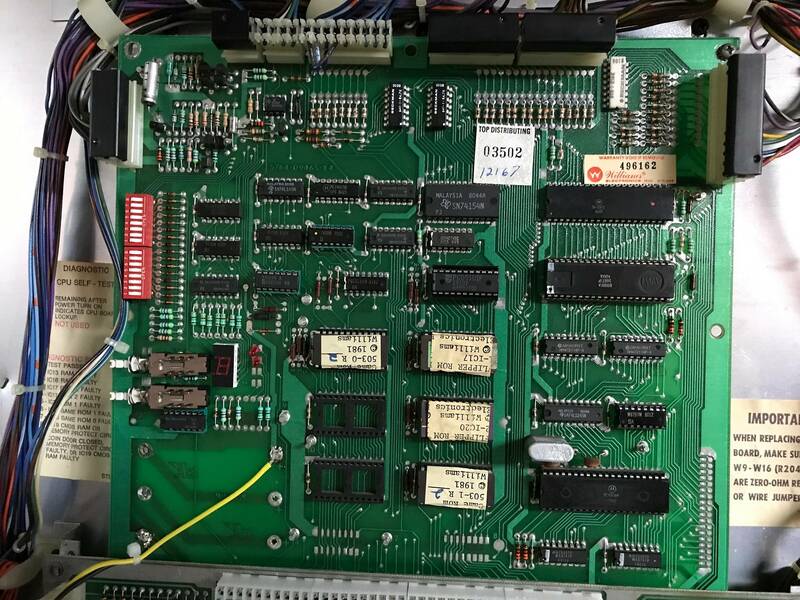 I just took the MPU and driver board out, re flowed solder and cleaned the 40 pin connections. Now the game boots to attract mode but when a game is started it just goes crazy and starts awarding points and acting likes it's being played even though there's no ball in play. I removed/cleaned all socketed chips one by one from the MPU with no change in this behavior. What does this new symptom point towards? Another thing I recently noticed is that it boots into audit mode every time it's powered on now. Sometimes it takes cycling though 50 twice to get it into attract mode. Once in attract mode, the light show and attract sounds work fine, but once you push the start button it goes crazy as mentioned in the post above this one. The batteries are brand new so does this indicate that the 5101 CMOS RAM (IC19) is bad? I'm putting together an order from Marco and want to have all the possible problem parts ordered at once. That being said, when I was working on my Black Knight with the Rottendog MPU, if I would switch the rom to a different game, then it would act like you're describing, as all of the switches are mixed up for a different rom. So if there was something screwing with the rom chip, maybe it would act like different switches were being activated and award points, play sounds, etc. No idea if this is what's happening, but thought I'd add my two cents. Good luck! 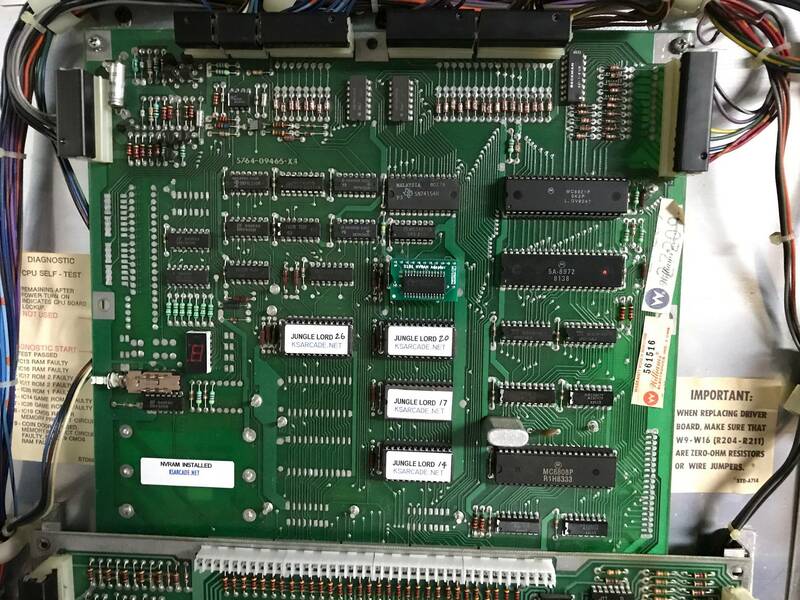 I ended up ordering a new refurbished MPU from K's arcade because after closer inspection of my original MPU it had some questionable looking repairs that had been done during its life. I received the new MPU today. Plugged it in and now I only get general illumination when powered on. No displays, no inserts, just GI. Service buttons do nothing. Test number reads 0 on the MPU when powered on and doesn't change when I push the test button. The sound board test works fine. I suppose my next move is to rebuild the power supply (which in retrospect I probably should have done first) but what should the voltage read on the MPU test points? Also, what should happen when I power it on without a driver board connected? Is that ok to do? I just want to rule out that it's not a driver board problem. Usually it won't boot without the driver board. I don't know what the test points are on that board, but you should be getting 5v between pins 1 and 5 of J2. On J2, pins 1 2 3 are ground. Pins 4 5 6 read 4.93 volts. Pin 9 is 12.5 volts. The board I got from K's is a little different from my original. It doesn't have the dip switches and it only has one test button. Is this the correct board for Jungle Lord? Looks like they just didn't bother populating stuff. The dip switches are only used on system 3 games, as is the top button. I finally found the problem. When I replaced the 40 pin connectors on the driver board I left a TINY blob of solder that was just barely bridging 2 of the solder pads together. So small and hardly attached that I was able to scrape it off with my fingernail. The game boots up now and I ran it for 6 hours straight last night with no problems. What a huge headache over such a small mistake! The game boots up now and I ran it for 6 hours straight last night with no problems. Makes me wonder if your old board is still good. It was an expensive lesson, but you must be happy to finally have it fixed! It's tough to diagnose something like that, intermittent problems are the worst. I was thinking the same thing but now that I have it working again, I'm not going to mess with it anymore than I have to. I'll keep the spare MPU for parts or maybe sell it to recover some of the new MPU cost. Expensive lesson, yes...but it still feels really good to find the problem.